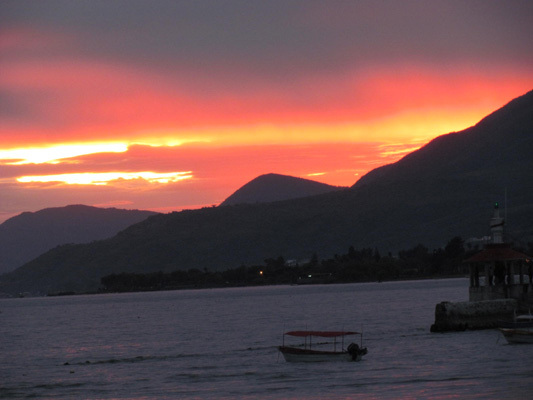 As the sun set on Lake Chapala, so has another wonderful season for us wintering in Mexico. We extended our stay through the end of April to enjoy more time with family and friends here in Ajijic. Now it is time to start Roaming with family and friends in the USA and Canada. 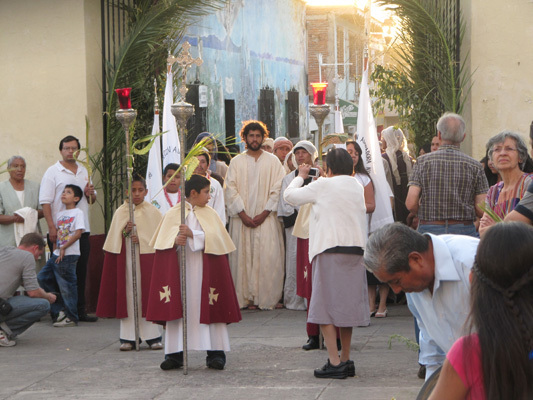 The first of April was Palm Sunday and the beginning of a week-long Easter celebration, especially throughout Mexico. 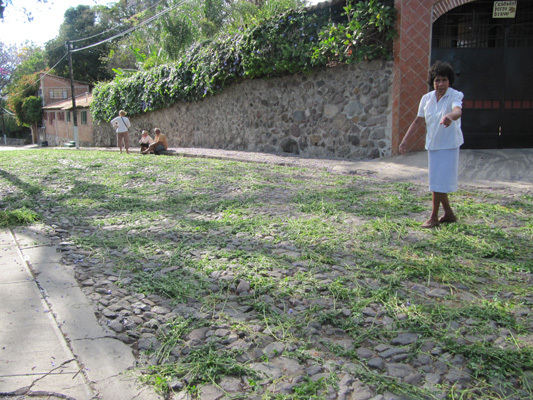 Rather than palms, alfalfa was laid on the street between the two main Catholic churches in preparation for Jesus's arrival. This reenactment of the Easter events are one of the finest Passion Plays in Mexico. 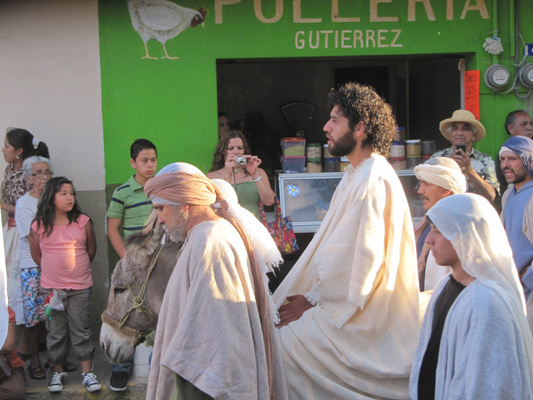 Here the actor portraying Jesus is riding a donkey, surrounded by his disciples. 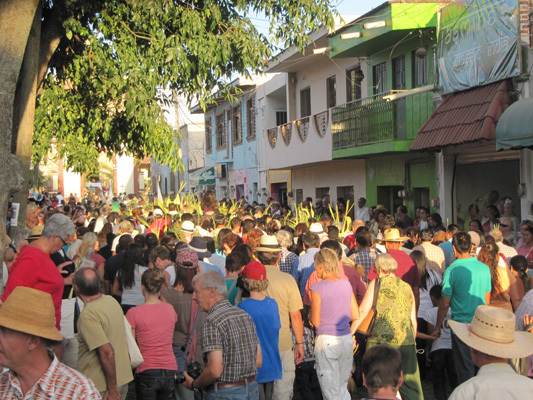 Thousands of people crowded the streets to partake in the procession along with Jesus. Some carrying palms, many braided and sold by local merchants. Here is Jesus entering the church courtyard, in preparation for Mass. Holy Week begins with the sixth Sunday in Lent. This Sunday observes the triumphal entry of Jesus into Jerusalem. 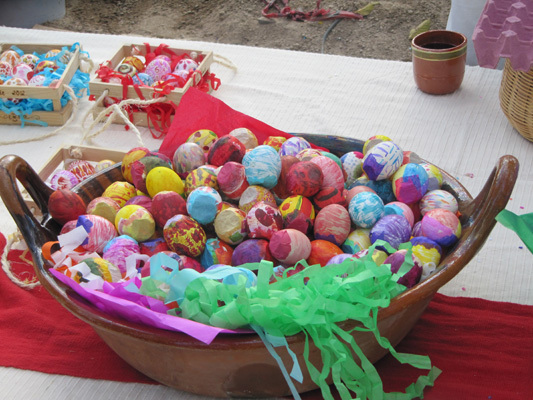 Easter celebration is another major fiesta, with schools closed for two weeks. 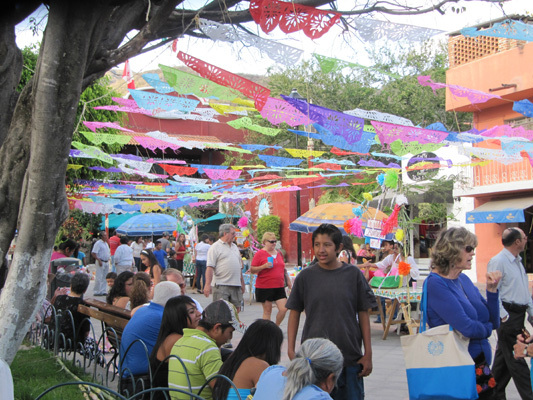 Here the main plaza in Ajijic is decorated with bright banners and filled with people joining in on the festivities. This is a basket of painted egg shells filled with confetti. Smashing them on people's heads is a popular tradition for birthdays, weddings and particularly over Easter. It is supposed to give them good luck. 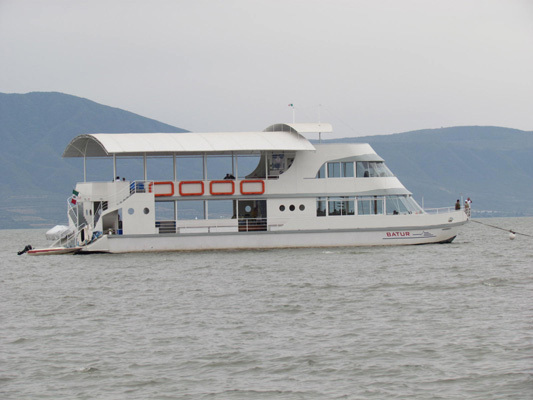 One evening we joined several of our friends for a cruise on Lake Chapala in this triple decker and largest boat on Lake Chapala. It is used mostly for parties and big events like birthdays, weddings, etc. Here is Larry, being tended to by Glorine--the care-taker, along with friends enjoying the evening. It rained that evening, but that did dampen the spirits. We did catch the sunset, noted by the opening picture above. 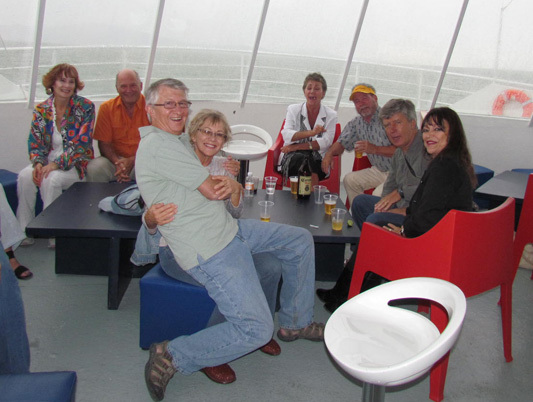 Chuck, Jean, Peter and Sybilla were among the 20+ friends who joined in on the fun evening of drinking, music, dancing, and sightseeing. April is when many "snowbirds" start their trek northward. Here Carolyn (second from the right) hosted a farewell dinner prior to her departure for Vancouver, BC. She has a beautiful rental in the heart of the village. Glorine organized, another Murder Mystery party, this one hosted by friends Lil and Norm. 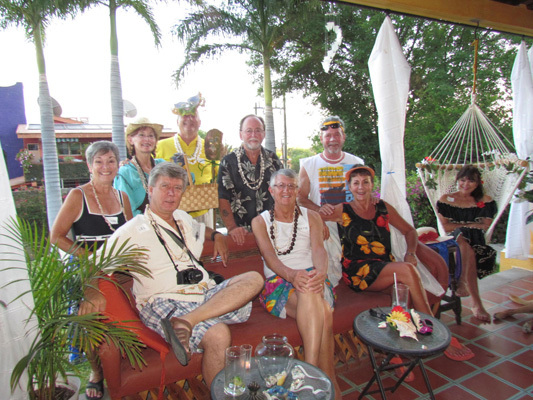 Their home was the perfect setting for the "Lethal Luau," a story set with a Hawaiian theme. The food and drinks were great. All eight characters were dressed the part to play their role. Each had a motive to kill, but all had great alibies. And like the first Murder Mystery party, no one guessed the guilty party. 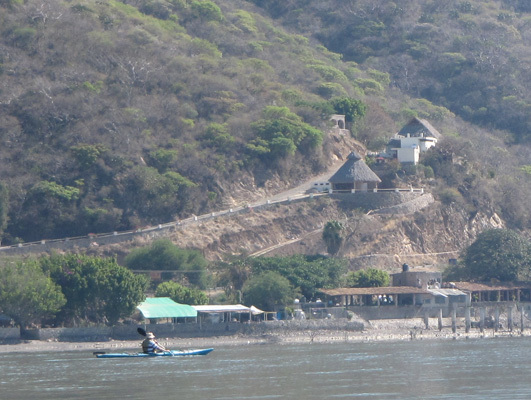 Kayaking has become a very popular activity on Lake Chapala over the past couple of years. 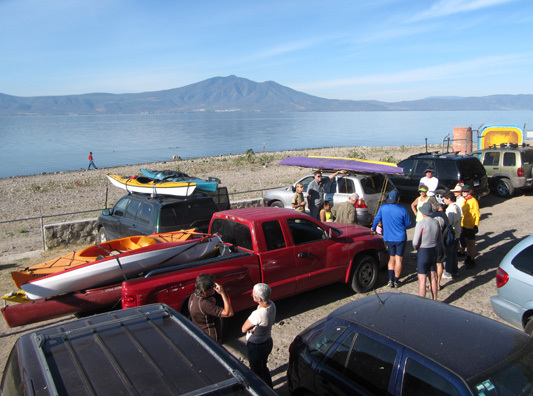 Here the Kayaking Club is loading up a bunch of kayaks stored in the parking lot of a favorite nightclub along the shore of Lake Chapala. Glorine was one of a dozen or so who ventured out on the lake on a beautiful Sunday morning. She took this picture of a fellow kayaker, with a restaurant and thermal spas in the foothills. 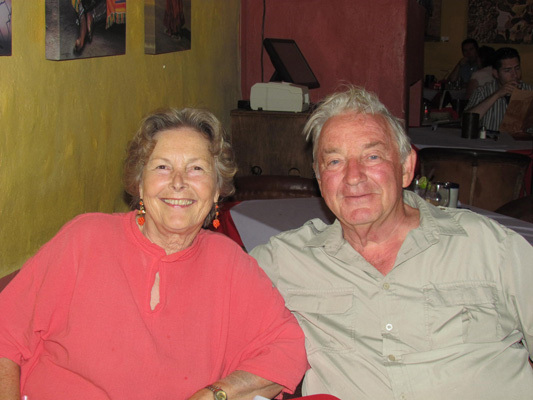 Our very first landlords five years ago and now good friends, Lise and Ken joined us for a lunch to catch up. Ken is a writer with one book already published and doing research on another. Lise introduced Larry to Sudoku, which is a wonderful pastime and good for the brain also. "Use it or Lose it!" That is what Larry's physical therapist told him. 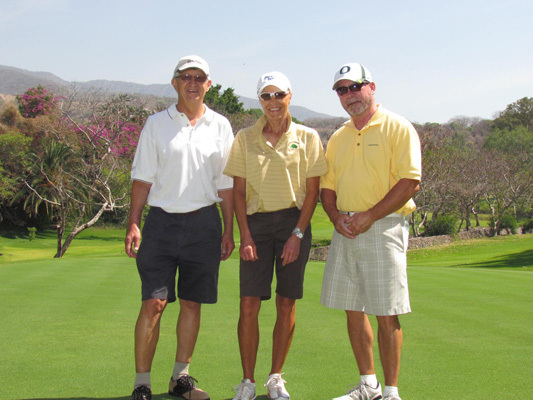 So he took her advice and joined up with friends Remy and Jerry at Chula Vista Country Club. They golf four times a week and they take golf much more series than Larry does. To him the score is secondary--the companionship and breathtaking views is what he enjoys most. Friends Mike and Sally had company from Boise, Idaho. 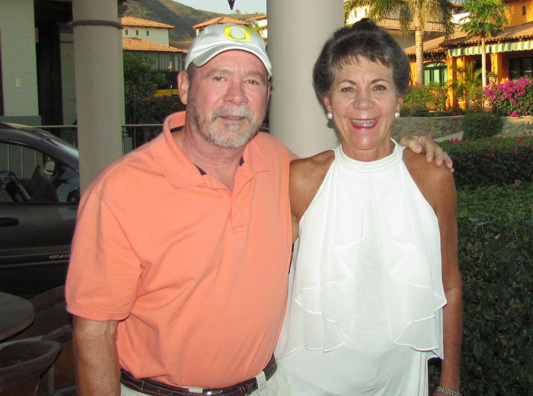 Sally's sister and her husband, (in the light blue shirt) gathered at a combination restaurant and "driving range," to meet friends and enjoy, what we call "the Ajijic magic." It was nice meeting someone who knew so many of the same people we knew from our days back in Boise. They call this the "Naked Stage." It is a little theater where actors read their script. Very minimalistic! 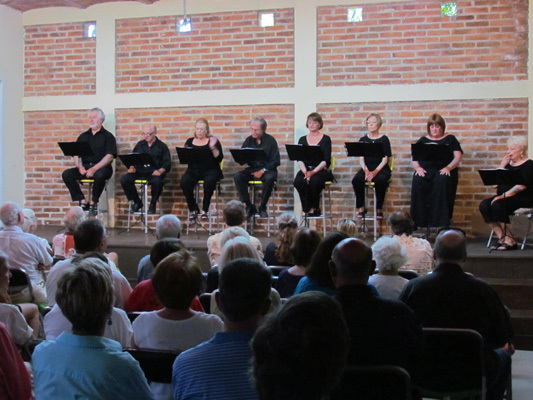 This play was Brighten Beach, a Broadway play set in the 1930s between the Great Depression and World War II. The actors portrayed two Jewish families living together, trying to make ends meet. It was another great event. After the Naked Stage, we had dinner with friends at a nearby restaurant, the same one we celebrated New Year's Eve two years ago. At that time, Glorine's sister and her three granddaughters rang in the New Year's with us. Here is one of the young boys that waited on us that night, and he clearly remembers dancing with the girls. He has gotten a lot bigger. 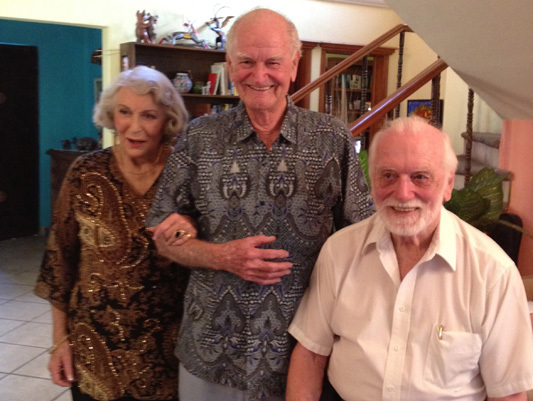 Peter, the man on the right, just turned 80. Here we are at a party in his honor, along with some of his dearest friends. He retired when he was 70, moved from his home in South Africa to Ajijic, and has become a fixture in the community. He is a great story teller with very interesting stories to tell. It is both great and unique to have family living in Ajijic. 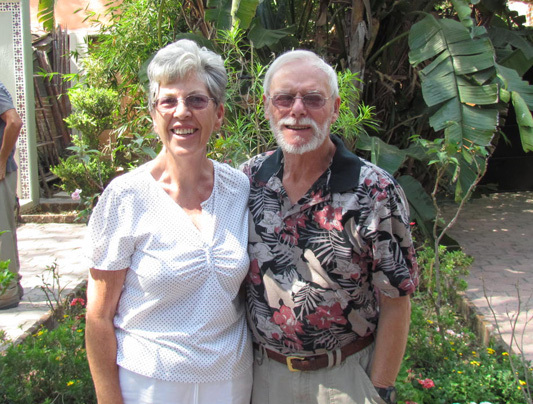 Wayne and Maureen have found Ajijic to be a great place to live. They own a home in the same development we rent in and are both very active in the community and truly enjoy all that Ajijic has to offer. 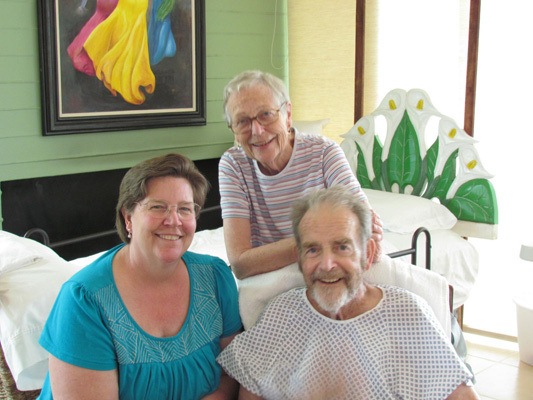 They were truly a "God Send," when Larry had his accident and were always there to lend a helping hand. Mochas Gracias!! Here is Wayne the "Commodore," of the Kayaking Club. He is taking Larry out for his first kayaking experience. 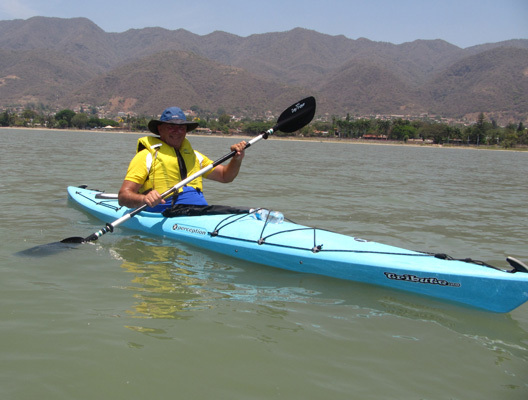 Wayne, along with members of the Sailing Club, started the Kayak Club and he has done a wonderful job at organizing a couple of kayaking trips on Lake Chapala each week. He learned how to kayak when they lived in New York and has used his skills to teach others how to do it safely, thus enjoying the experience. Maureen has many passions--one of them is painting. When they moved to Ajijic, she did not know oil from water color. 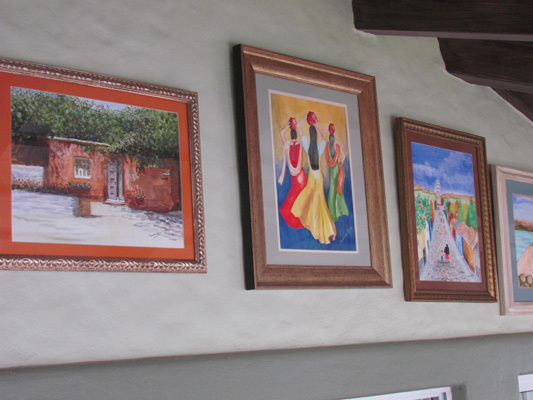 Here are just a few examples of the many painting she has done since moving to Ajijic, four years ago. She continues to take lessons from local artisans and has become very accomplished. 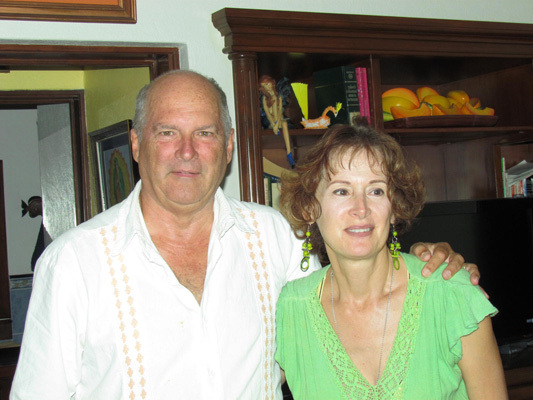 We just met Mike and Patty while visiting our friend Yvonne, a lady from Guadalajara we met during our first year in Ajijic. Patty and Yvonne went to elementary school together. 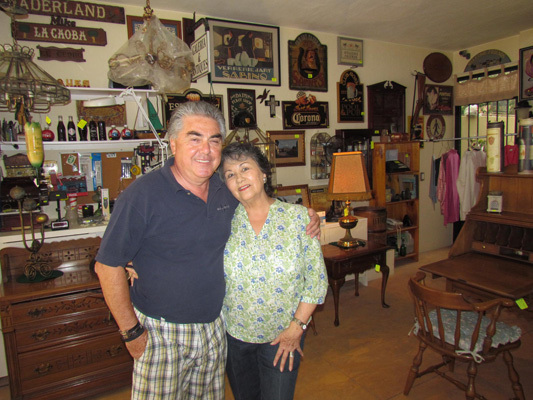 Mike had several antique and furniture stores in Guadalajara, prior to retiring to Ajijic. As you can see, they still love their antiques. 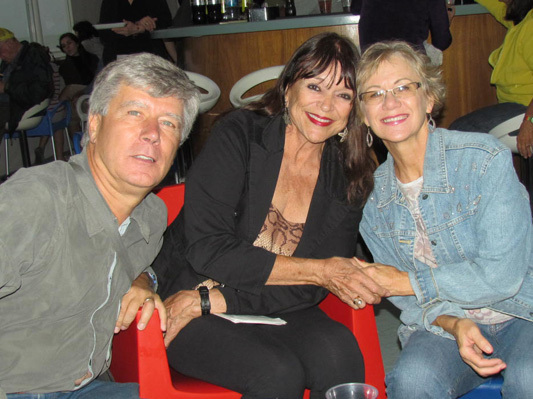 Here are friends Roger and Carol, with their daughter Teresa who was visiting from California. Roger, like Larry, thought climbing walls and ladders was just fine. Unfortunately, Roger fell, hit his head, suffered a minor stroke and is now recuperating at home. He has made tremendous progress since the accident, thanks to a loving family and the wonderful medical care. Best wishes amigo! One afternoon, we spent the day wandering through the heart of the village of Ajijic. 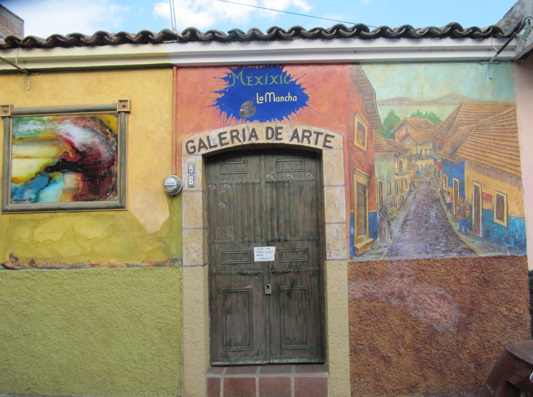 It is very friendly and very colorful, with many stores decorated with murals, artworks and wonderful doors to welcome guests. 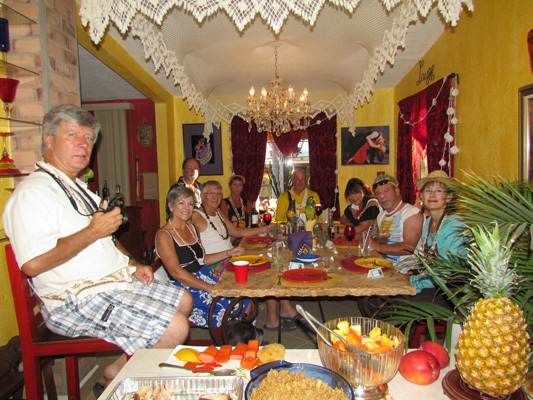 We have found Ajijic an inviting place to live, filled with warm and wonderful people. This photo was taken in the Plaza, which is great place for people to meet and greet. The Plaza is filled with restaurants, stores, museums, gardens, etc. 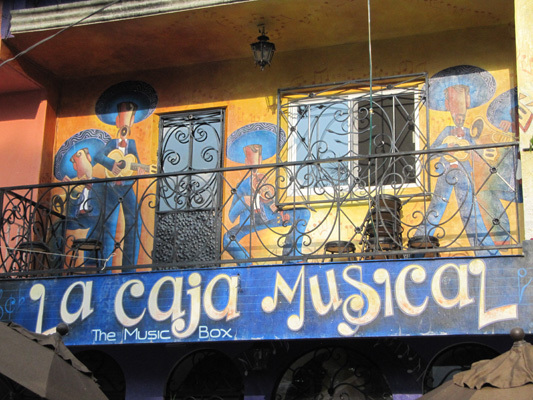 Here is one of the local cantina in the plaza with a great mural painted on the balcony. 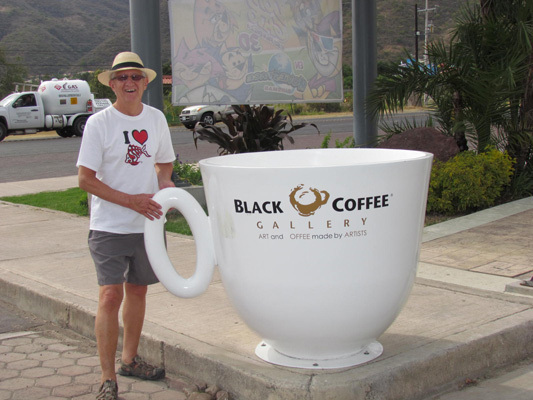 Larry decided he needed to cut back to only one cup of coffee per day, so he is looking into a new cup. Just kidding. This cup is in front of a new upscale coffee house that recently opened near our villa. Yes, Ajijic is changing. 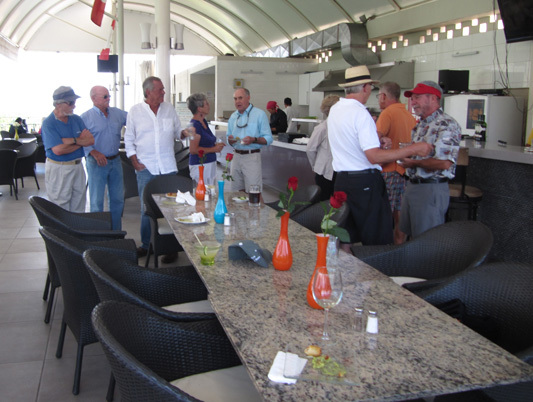 The Sunday morning before leaving for California, we attended Open Circle at the Lake Chapala Society. And said farewell to several of our friends, including Maureen and Keith. They are originally from Ontario, Canada and now live here full time. This year, Maureen and Glorine got into knitting. Keith had knee surgery in December and, as Larry did, just completed his physical therapy. 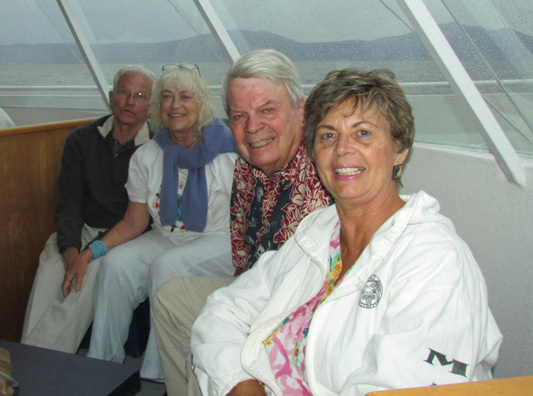 With our car fully packed, friends Jerry and Gloria stopped by our villa to pick us up for our last outing of the season--attending Open Circle and then a going away brunch. Interestingly, we first met at Open Circle four years ago when they introduced themselves as "first timers" from Portland, Oregon. Beings as we once lived there, Glorine introduced ourselves, which led to such a great friendship. Here is Glorine with Norm and Lil. 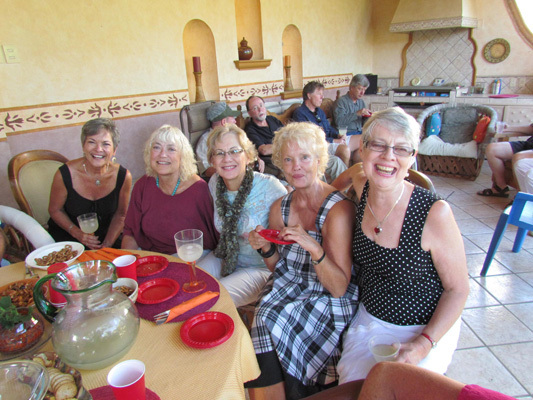 They hosted a going away brunch for us at their beautiful home in the foothills west of Ajijic. We have known them since we first started coming here and they are such fun to be with. 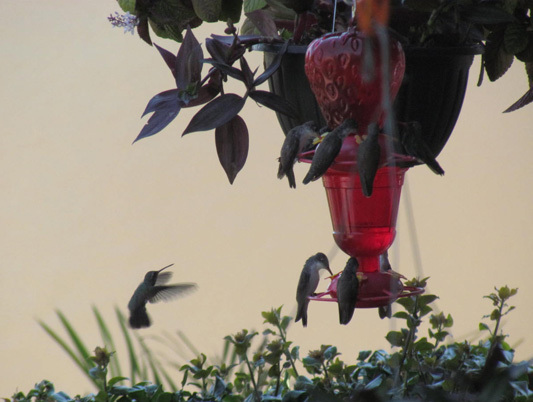 These humming birds are not snowbirds, they live here year round. Looks like it is dinner time and one is waiting his turn at the table. These creatures are another one of the sights and sounds that make Ajijic such a wonderful place to winter. 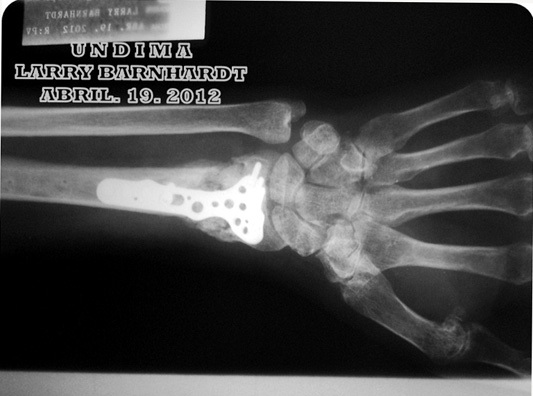 One accident, two surgeries (one including the installation of this titanium plate), and four months of tender loving care, Larry is doing remarkably well and getting back to normal. His range of motion and his strength are back to about 75 percent and improving. Once the cast was removed, Dr. Bretice Madina started performing physical therapy, some done here at our villa. Here she is applying electrical stimulation to Larry's arm. 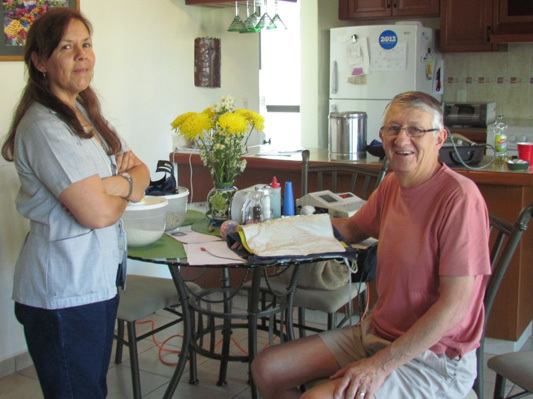 In all he saw her 15 times and is another example of the wonderful medical care he received here in Mexico.